Marvelous Multiagers! 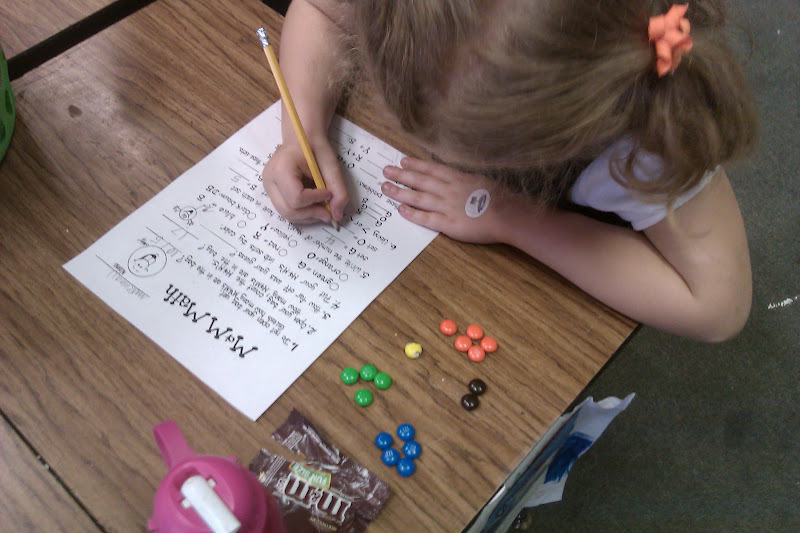 : Math With M&Ms! I am coming to you in the midst of my weekend full of church. Yesterday we had school Mass, as usual. 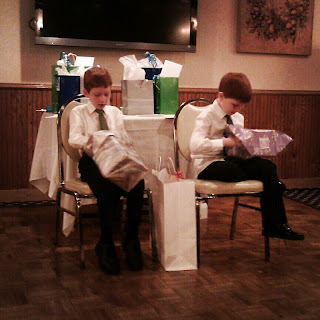 Today I went to my twin nephews' first Communion. And tomorrow is one of my second graders' first Communion. The other four have theirs later this month. Here's a picture from the first Communion after-party today! Onto what this post is about! Yesterday was M&M Math Day. While looking online for good ideas to use, I found a bunch of great M&M Math activity pages! There are a lot of different ways you can use M&Ms for math (graphing, probability, mean/median/mode, and so on), and the activities are written out super well. They aren't the cutest sheets ever, but they fit a TON of different things on each work page. For first grade, I used Math Activity Page 1, which focused on sorting, counting, greater than/less than, and adding. With a little help from me to get them started, they were able to do the sheet very independently. And they had a lot of fun! 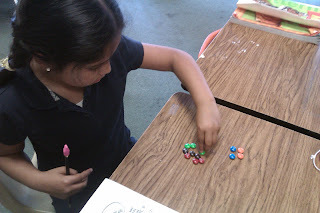 For second grade, I used Fraction Fun with M&Ms, which was a good review of fractions of a set. It also covered greater than/less than. I don't think the students expected to do quite so much math with their M&Ms... but they did really well with all of the activities. My reading curriculum focuses on... I think 10 kids. All the stories are about those 10 kids. In first grade, there isn't an overarching plot that connects the stories together. There are just a bunch of stories about random stuff the kids do. The last unit I'm teaching is about the kids going to Super Happy Fun Land. In second grade, the stories take place within the context of a school year and it follows the trials and tribulations (and drama) of the kids in school. Recently in our soap opera reading book, the kids' teacher got the flu and they had a substitute. 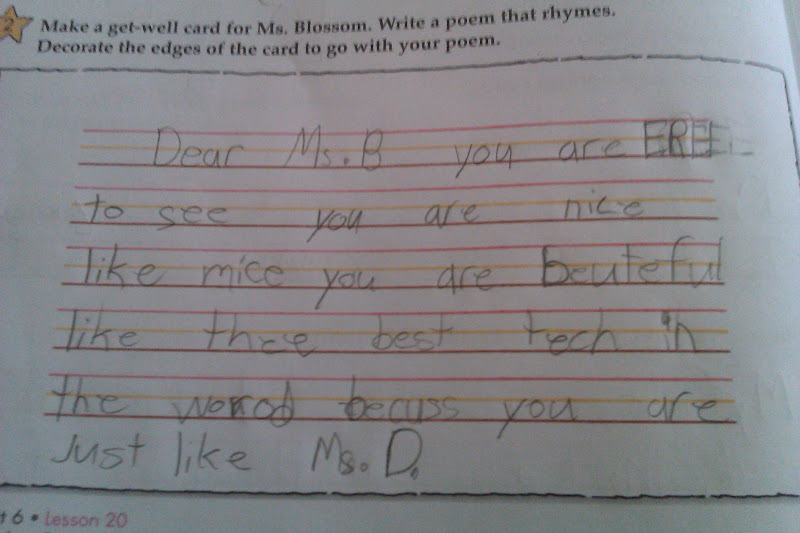 The substitute had the students write get well poems for their teacher, and in my students' workbook, there was a little section for them to write their own get well poem for the pretend teacher. 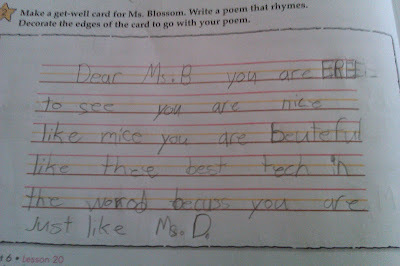 Aw, I'm the best teacher in the world! Hope you're having the best Saturday in the world today!! Yay for MnMs in math! Here's my pack, in case it can help you out later or next year!